We will be having a special event station operating this year for our 50th Annual Hamfest. We need volunteers to operate in 1 hour shifts Friday and Saturday 8:00 am to 2:00 pm during the hamfest. For those interested in volunteering please contact Kevin at 1-479-216-0033. Help us make this the best hamfest yet! To help celebrate our 50th, we will be giving out patches with the design below for a $5.00 donation. We have ordered a limit number, and they will only be available at the hamfest. They will be available at the hospitality tent until they are gone. Sorry, no pre-sells, or holds. 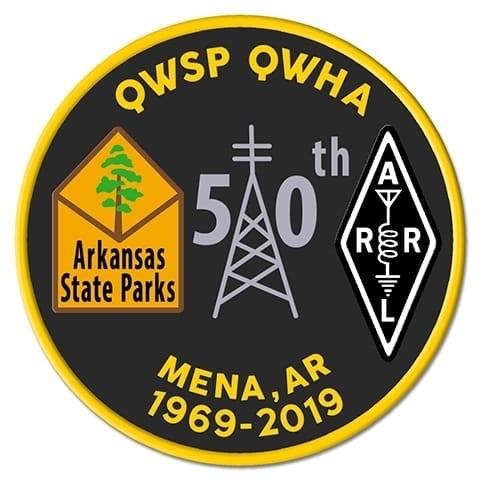 QWHA host Arkansas ARRL State Convention 2019 for 50th!!! We’re pleased to announce that Director Norris has approved the holding of an ARRL approved Arkansas State Convention (50th Annual Queen Wilhelmina Hamfest) on September 6-7, 2019 in Mena, AR under the sponsorship of the Queen Wilhelmina Hamfest Association. Come enjoy the beauty of Rich Mountain with family and friends. Fifty years ago a number of guys on 75 meters decided to come to this place to do just that. Y’all come enjoy the mountain, fellowship, and let’s get acquainted. Just 13 miles west of Mena, Arkansas, on Hwy 88, Queen Wilhelmina State Park sits at an elevation of 2500 ft on Rich Mt. Plenty of flea market area provided inside or outside the two tents. Bring your own tables, chairs, and electricity. All spaces under the tents and outside the tents are a $10.00 donation. Flea market spaces are first come first serve! Limit one vehicle per tent or flea market space. For tent and reservations please e-mail James at n5ad@att.net or call 1-479-243-4921. Checkout Friday’s Cookout Menu here, and Saturday’s Banquet menu here. 35 RV and 6 tent only spaces with plenty of overflow camping allowable. For those of you who will spend the night in your vehicle, the park will charge you for overflow camping. * – All people staying over night in the park must register at the lodge. * – A tent space or flea market space does not include a free night in the park. VE testing and meetings all held on Saturday. Check registration table for times. Check this web site often for times and updates. Copyright © 2019. QWHA All rights reserved. | Powered by WordPress | tpSunrise theme by Tekpals.